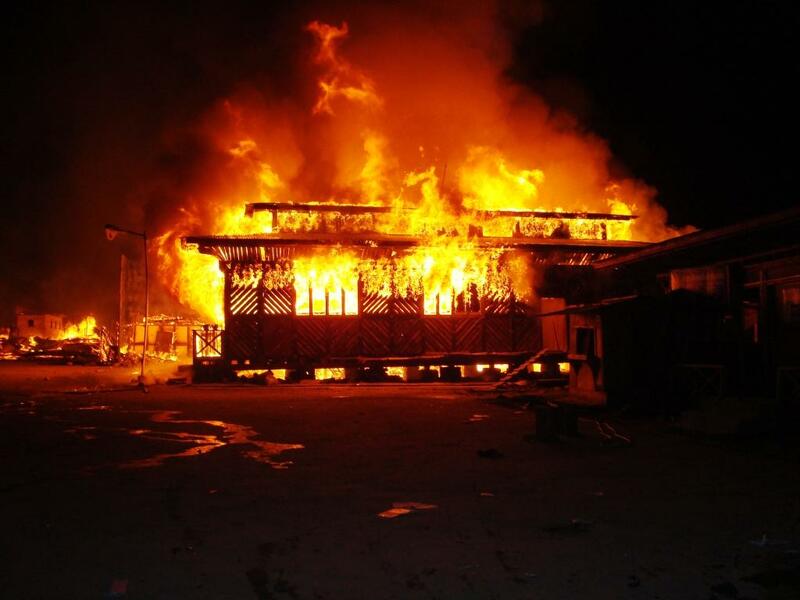 In the early hours of 26th October 2010, a devastating fire ravaged through Chamkhar town in Bumthang raising 66 shops to the ground and leaving about 267 people homeless for months. The fire which was believed to have started from a mobile phone shop belonging to Kuenzang Tshomo lasted for three hours before local residents, school children and travellers brought it under control. The fire started at around 1:45 in the morning when everybody was fast asleep. Two people perished in the fire and one was injured. A helper of a shop and a traveller who was on his way from Trashigang to Thimphu were among the dead. While the police could not establish the actual cause of the fire, many attributed it to possible short-circuits or negligence. But a handful of victims doubted if it was intentional although they did not have any clue who could be behind the act. Many people went through a lot of trauma following the tragic incident. They lost almost everything they had: some to the fire and some to robbers who came in disguise of helpers. Dorji could escape the raging fire but he could not escape the robbing helpers. He claims he lost over Nu.1.3 million to those who came to help him and the rescue teams confirmed such things could have happened as some people were seen running away with belongings and equipments. Despite all the challenges during the aftermath of the tragedy, life gradually began to return to normalcy with timely intervention from government under the special command of His Majesty the King who personally oversaw the reconstruction works and relief efforts. The victims were provided free CGI sheets and timber to rebuild their houses. With the world turning back to square again, people gradually began to forget the traumatic experience of the incident. With the construction of new houses progressing fast, everybody thought that the tragedy was over. But this sigh of relief lasted only for four months. Around midnight on 18th February 2011, the residents of Chamkhar town were once again forced out of their houses when the fire emerged from a small hut located behind a Drayang. Within minutes, it gutted over 18 houses and affected about 100 people including one casualty. The government came to the immediate rescue and helped the victims rebuild their houses and restore their life. This time, the number of people who thought the fire could have been caused deliberately by some people increased and many believed it could not have been an accident. But once again, the police could not determine the involvement of any human culprit in the act. Instead, they closed their investigation stating that the fire had started from a small hut in which an employee of a hotel lived and since the hut did not have electricity, he was using candles. The police concluded that the fire was ignited by the candle which the employee of the hotel had forgotten to put off when he went to sleep. However, this finding by the police did not convince many victims but they had no means to analyze the finding further. Nevertheless, life continued as usual for the residents of Chamkhar town until the same tragedy struck them just three months later. At around 2:20 in the morning of 28th May 2011, an owner of a shoe-shop woke up to the screams of his mother. His mother had noticed the fire on the wall of their house and by the time he woke up, his mother had already poured a few buckets of water to douse the fire. He then woke up other members of the family and together, they successfully put off the fire in their house. After informing the police about the incident, he was just helping his children sleep again when he heard a commotion on the other side of the road. The fire had picked up on the opposite row of houses. Then at around 3:45, another fire started between Bhutan Post office and a medical shop, below Gedhen Tshongkhang which sold religious items. “There is no way the fire could start from that part unless someone does it intentionally” he said to reporters. Sithar Lhamo, the owner of Gedhen Tshongkhang told reporters that when she woke up to the commotion in the area, her house was already full of smoke and that she did not get time to pick up anything except her three children. With most people now suspecting foul play, the Ministry of Home and the Royal Bhutan Police even announced the reward of Nu.50,000 to anybody who can provide concrete information leading to the arrest of the culprit. The special investigation was launched on the same day to hunt for who was behind such acts. The fire gutted 30 houses including 8 new units constructed after the earlier fire disasters, and left 173 people homeless. It also destroyed three parked vehicles. All the victims kept their fingers crossed that the culprit would be found but as months passed by, no clues could be gathered. A man was arrested on suspicion but later released as the evidence could not be established. Finally in October 2011, the police officially called off their investigation partially shifting the blame onto the public saying they did not cooperate well with the investigation team. But the people of Chamkhar town said they did not have any information to provide to the team. So, how did the disaster really happen and that too within close intervals: three fire accidents just within seven months? If it was ever caused intentionally by somebody, who could that person be? And how could he or she have so mysteriously evaded our security intelligence? Over four years have passed since that final disaster, yet the culprit, if it was ever committed intentionally, seems to be still at loose. Is there any possibility that he would strike again in the future? However, till the secret investigation which the police have promised to continue, can trace the culprit someday, this fire disaster would continue to remain as a mystery for Bhutan.